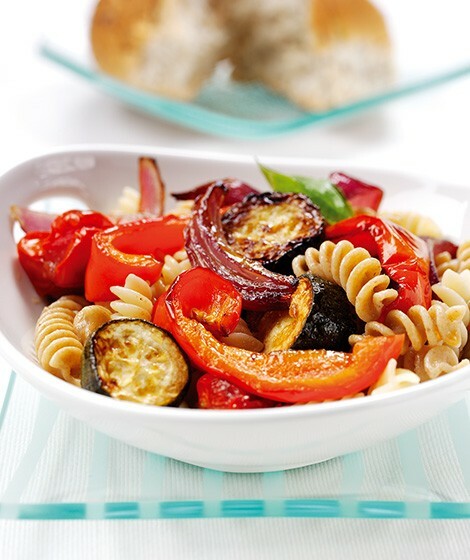 A delicious recipe to give you a healthy Whole Grain and vegetable boost. Place all the vegetables and basil on a baking tray and drizzle over the oil and vinegar, season well. Roast for about 30 minutes. Meanwhile, bring a large pan of water to the boil and add the wholemeal pasta and cook for 1 minute, add the plain pasta and cook for a further 9 minutes until tender (or cook pasta according to pack instructions). Drain and return to the pan. Stir the vegetables into the pasta and serve immediately.